Thanks to all who came to our recent Spring Tasting; with summer approaching there was naturally a keen interest in Whites and Rosés. Top sellers were three refreshing, dry Spanish Whites – Peregrino Albarín 2014 (a rare grape from DO Tierra de Leon), “Lagasca” Viognier 2014 (an organic and biodynamic wine from Dominio de Punctum in La Mancha) and Pazo de Mariñan from DO Monterrei in Galicia ( a terrific blend of Godello, Treixadura and Albariño). 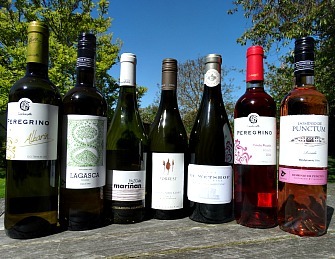 Other Spanish whites also sold well including Prado Rey Verdejo 2014, but there was no more room in the photo! The variety, quality and value in Spanish White wines often surprises people. The cooler climate of Northern Spain produces some excellent wines and with careful viticulture and night-harvesting, there are some good wines being produced in La Mancha, in Central Spain too. Two other top sellers were from the new world, a New Zealand Sauvignon Blanc 2012/13 from Forrest Estate (we are now selling the IWC Gold Medal winning 2013). We have all forgotten how good unoaked Chardonnay can be and this was borne out by the popularity of a Chardonnay from South Africa’s highly respected Chardonnay specialist De Wetshof “Bon Vallon” 2013; the 2014 will be with us soon, which is just as good! Now is the time for Rosés and both top sellers came from Spain – one a blush organic Rosado 2014 from Dominio de Punctum, made from Garnacha – the other our award-winning, great food wine Peregrino Rosado. Both Rosados are dry and delicious, Dominio de Punctum organic Rosado is a great aperitif and will accompany fish and lighter dishes whereas Peregrino Rosado is brilliant with full-flavoured fish (salmon, mackerel, sea bass) and Thai style dishes, spicy Spanish dishes including Chorizo or BBQs. Check out our Wine Shop for more information on these wines.